The client’s brief was to improve daylight into the kitchen at the rear of the ground floor of this 4 storey Victorian mid-terrace house. The brief asked for a remodel to the kitchen area, rerouting of services, provide a kitchen larder to reduce the need for high level units and provide good storage, new bathroom and bedroom at first floor. 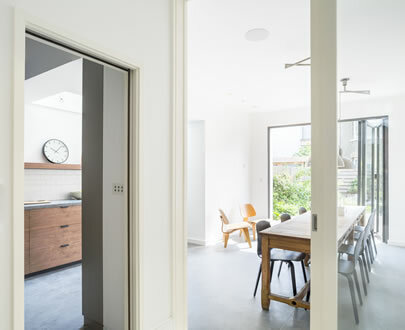 The existing kitchen and dining room were partially connected across the rear of the property by extending into the narrow side passage but retaining the existing dining room layout. The project also includes thermal improvement such as under floor insulation, internal wall insulation, and new double glazed windows to throughout of the property. The extension has been formed from second hand London stock bricks with the roof and guttering in pre-weathered anthra zinc roof in combination with high performance aluminium-framed windows and doors. The glazed doors to the kitchen/dining room are sliding folding doors to connect the space to the rear garden. Internal finishes include grey limestone floor tiles, crackle glazed tiles, slate work top, walnut drawers and shelves in the kitchen.